Animal tissues. Smooth muscle. Atlas of Plant and Animal Histology. The image is from small intestine. Smooth muscle: muscle layer of the small intestine. Technique: haematoxylin and eosin, 8 μm thick section, paraffin embedding. 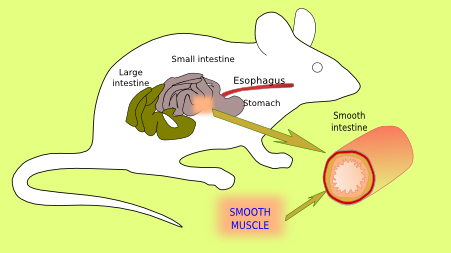 The smooth muscle of the small intestine is shown in this figure. In the upper part, the smooth muscle are observed in a transverse view, whereas in the lower part smooth muscle cells are oriented parallel to the cutting plane. Smooth muscle cells are fusiform, small in diameter, and with a nucleus adapted to the morphology of the cell. They are non branched cells. 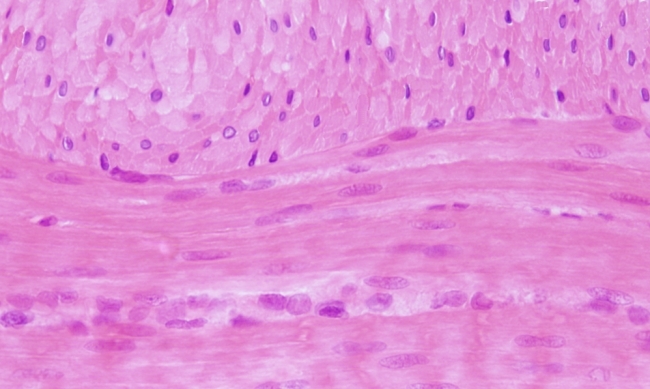 Unlike the skeletal and cardiac muscles, striations are not observed in the cytoplasm, . This is because the cytoskeletal filaments, actin and myosin, are not arranged so regularly, but more scattered. That is why the cytoplasm shows a homogeneous pink stainning.